Time Warners' earnings call may have revealed a little more Batman information than it intended. The secret's out: the next instalment in the Batman franchise is due in 2013. No, we don't know what it is, or when it's set, or even who's writing it, but according to CFO John K. Martin, you can expect it very soon. The news came as part of a Time Warners' earnings call. Martin didn't add any details to the announcement, which probably wasn't intended as an announcement per se; it was just part of a long list of predictions and not-quite-promises he was making for the company's bottom line in 2013. 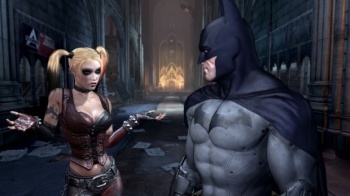 "And we also have a strong games release this year," Martin said, "which will include the next release in the Batman Arkham franchise. So all in all, we expect Warners to post another very strong year in 2013." You may recall that Warners recently staked its claim to a bunch of domains, but it's still not clear from that information what the next in the series will be called. Place your bets! Remember, Universe is on the table, and probably has pretty decent odds given that, of the domain list, five had some form of 'universe' in the title. And as for what kind of game it might be ... BAM! POW!